Each Day Sail is limited to 12 guests which means that everyone can be actively involved in all aspects of working the vessel from sail handling to steering. Alternatively just sit and watch the beautiful rivers Orwell and Stour pass quietly by. Thalatta offers plenty of deck space, personal attention by the crew as we keep numbers to a maximum of 12 passengers, extensive catering, comfort below, and the opportunity to participate in sailing the barge or relax and watch the beautiful scenery, just as you wish. For dates and booking details of upcoming Day Sails and Cruises please go to the What’s On page. Group Day Sails or longer trips are available at other times for a party of friends, neighbours or work colleagues – see our Private Hire page for more details. We have a limited number of Day Sail Gift Vouchers available to buy each season. 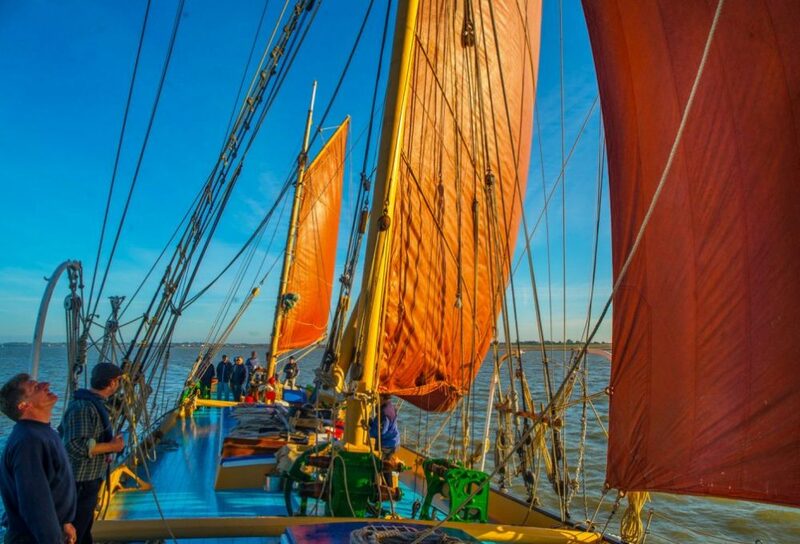 These are the perfect gift for someone who’d love to spend a day sailing a historic Thames Barge on the beautiful River Orwell and River Stour in Suffolk. The recipient can choose themselves which Day Sail they’d like to come on. Day Sail Gift Vouchers are £70 for an adult and £50 for a child.